Basket making preceeded pottery making. In many prehistoric pots there are impressions of a basket. It is one of the oldest known crafts to mankind. 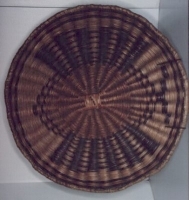 There are three basic techniques used today to make baskets. These are coiling, plaiting, and twining. Collecting baskets can be most satisfying. When selecting a basket, consider consistency of color, size, and design.